Slight clearing of still-dusty martian skies has improved the energy situation for both Spirit and Opportunity, allowing controllers to increase the rovers' science observations. Spirit has been commanded to move its arm for the first time in nearly three weeks. 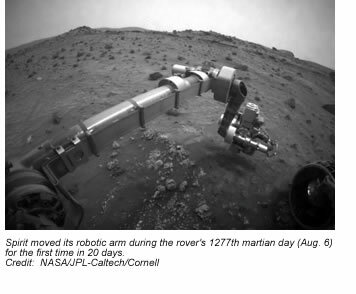 It will position the arm's microscopic imager to take a series of photographs of two soil targets and one rock target. Opportunity's planned science observations are for studies of the atmosphere. Having explored Mars for three-and-a-half years in what were missions originally designed for three months, the rovers have been facing perhaps their biggest challenge. Since June, a series of severe martian summer dust storms has affected both Opportunity and Spirit. The dust in the martian atmosphere over Opportunity has blocked 99% of direct sunlight to the rover, leaving only the limited diffuse sky light to power it. Scientists feared the storms might continue for weeks. If the sunlight had been further cut back for an extended period, the rovers would not have been able to generate enough power to keep themselves warm and operate at all, even in a near-dormant state. The rovers use electric heaters to keep some of their vital core electronics from becoming too cold. NASA engineers have been taking proactive measures to protect the rovers, including suspending driving and science observations. Energy production from solar arrays increased to 295 watt hours on Spirit's 1276th martian day, or sol, which ended early Aug. 6, and to 243 watt hours on Opportunity's sol 1255, which ended midday on Aug. 5. The solar panels generate electricity from sunlight. The dust storms had cut daily output as low as 261 watt hours on Spirit and 128 watt hours on Opportunity in recent weeks, compared with levels above 700 watt hours per sol before the current series of storms began. One hundred watt hours is what it takes to run a 100-watt bulb for one hour. The increased output from the solar panels, although slight, has allowed Opportunity to fully charge its batteries and Spirit to bring its batteries to nearly full charge. Also, the temperature of the core electronics module on Opportunity, which was of concern when it fell to minus 35 degrees Fahrenheit (minus 37 Celsius) last week, has increased to minus 28.1 degrees Fahrenheit (minus 33.4 degrees Celsius). A possible outcome of the storm is that one or both rovers could be damaged permanently or even disabled. “Conditions are still dangerous for both rovers and could get worse before things get better,” said John Callas, rover project manager at NASA's Jet Propulsion Laboratory. “We will continue our cautious approach to the weather and configure the rovers to maintain a high state of charge on the batteries. Communication sessions with both rovers will remain limited until the skies clear further.” Engineers will assess the capability of each rover after the storm clears.